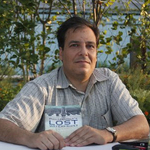 Hello, I'm Harry Kyriakodis, author of the book Philadelphia's Lost Waterfront and a founding certified member of the Association for Philadelphia Tour Guides. I'm also your virtual guide today. You should be standing in front of Christ Church on the street between the church and the park next to it. I'd like to to tell you a bit about this church before we get going, so take a seat while you listen. Anglicans of the Church of England founded a small wooden place of worship here in 1695. They later decided to build the most sumptuous church in the American colonies. The church you see today was constructed between 1727 and 1744. It's considered one of the nation’s most beautiful eighteenth-century structures, a superb example of Georgian architecture and a monument to colonial craftsmanship. Christ Church's steeple was financed by lotteries managed by Benjamin Franklin. The tower pierces the sky at 196 feet, and was the tallest structure in North America for almost a hundred years. The “Philadelphia Steeple,” as it was commonly called, could be seen from miles away by seafarers sailing up the Delaware River toward the city. Even today, the Christ Church steeple is a prominent landmark. After the American Revolution, Christ Church could no longer be an Anglican church. Church officials in England agreed to establish the Episcopal Church in America. So Christ Church is the birthplace of the Episcopal Church in the United States. We're almost ready to get going, but first let me explain how this works. VoiceMap uses your GPS location to play commentary automatically. So you can put your phone away now, and just focus on your surroundings. I'll give you directions to keep you on track, so unless I ask you to stop for a closer look at something, you can just keep walking. Make sure you bring a pair of headphones or earphones, as Interstate 95 and Delaware Avenue produce too much noise to use your phone's speakers. Let's go. If you're facing the church, turn right at 2nd Street and walk towards Market Street. There are no restroom stops, but you can visit one of several restaurants which I will point out along the way. Please be careful, by the way, of traffic along the entire route.